1. Sauté beef, ginger and garlic powder in a skillet over medium-high heat until meat is browned. 2. In a bowl, mix sugar, soy sauce, cornstarch, sesame oil, pepper flakes and water. 3. Add sauce to beef and cook for 5 minutes. Add broccoli and cook until tender. 4. Serve over cooked bulgur. 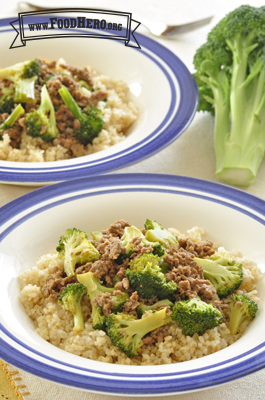 1 Comments for "Beef and Broccoli"
I made this recipe at home and my family loved it. So, I decided to have my Nutrition and Foods class make it as well. The recipe got rave reviews. One boy even said, "I thought I didn't like broccoli, but this tastes really good!"